The inspiration for writing a book can be multi-faceted, but on some occasions, it simply comes from the fact that when you research a subject, you find the information very difficult to obtain. On this occasion, that is exactly where the motivation to produce this work came from. In my efforts to publish a great many of the previously unpublished or extremely rare journals, diaries or letters written by soldiers in the Napoleonic wars, their accounts often take me to far off lands, well beyond the well- trodden paths of the Iberian Peninsula, Southern France and Belgium during the Waterloo campaign. For the First ‘Great War’ reached well beyond the realms of Europe; with fighting occurring in both North and South America; the West Indies; Africa; India and the Middle East. In recent times I have been working on a number of journals of British soldiers who served in Malta, Corsica, Sicily, Egypt, Eastern Spain, Italy and even in Montenegro and Serbia amongst many other locations. Researching their journals, both to ensure their accuracy and to highlight unusual claims or statements which challenge the perceived history of this period, it has become painfully obvious to me and a source both of great surprise and supreme frustration that there is no complete history of the wars in the Mediterranean from 1793-1815. The same complaints can also be levelled in reverse at Sir John Fortescue’s masterful A History of the British Army, which consists of no less than fifteen volumes of text plus an additional five volumes of maps, written between 1899 and 1930. Because of the great size and scope of these broad histories, their all-encompassing approach also makes it very difficult to follow the campaigns in a logical progression and indeed some lesser campaigns are virtually ignored completely. For example, Fortescue almost omits the island hopping campaign off the Serbian coast in 1813-14 in total. Piers Mackesy did deal with The War in the Mediterranean in his excellent single volume history published in 1957, but concentrated heavily on the political aspects and arbitrarily restricted himself to the period 1803-10, which would lead readers to assume that little of significance occurred in the Mediterranean before 1803 or after 1810, which of course is a complete fallacy. Since then, a number of pictorial naval histories have dealt with specific aspects of the war, including the blockades; commerce raiding; the frigate war and the great naval battles and all touch on the Mediterranean to a greater or lesser extent, but none view the operations in the Mediterranean as a whole. Finally, Nick Lipscombe has championed the war in Eastern Spain and has sought to give it a greater importance, seeing it as an integral component of Wellington’s campaigns in the peninsular. This laudable, almost single handed campaign, has forced us to re-evaluate these operations and his works are a valuable and thought provoking addition to our understanding of the overall strategy. Beyond these few exceptions however; nothing of consequence has been written regarding the war in the Mediterranean in the last two hundred years and it is high time that this was corrected. Students of the Napoleonic Wars will almost certainly be able to name some of the major events of the campaigns in the Mediterranean in the wars against both Revolutionary France and their effective continuation under Napoleon. The Siege of Toulon; the Battle of the Nile and subsequent Egyptian campaign; the Battle of Maida; the forcing of the Dardanelles and possibly the campaign in Eastern Spain will probably spring to mind, although few will have a detailed knowledge of them and certainly not of how they fitted into the worldwide jigsaw of Britain and her allies’ strategies. Far fewer will be aware of the naval actions during the revolutionary wars, beyond Nelson’s victory at the Nile, when Britain was slowly forced to concede superiority at sea and eventually to abandon the Mediterranean altogether for a year or more; only to return and slowly regain the ascendancy until the Mediterranean was virtually turned into a ‘British lake’ by the end of 1813. By comparison, the Army in the Mediterranean was initially required for little else beyond the protection of the naval bases; but their strength and role grew ever more significant as more and more lands came under British control and the theatre became of greater importance. Indeed, it is rarely understood that in many aspects of the later campaigns, the Army held far greater influence over proceedings in this theatre than the Navy. 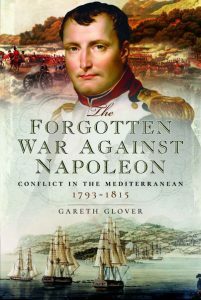 These lesser known operations include the capture of Napoleon’s homeland, Corsica, in 1794; the capture of Minorca; the siege of Malta; the mutiny at Gibraltar; the American wars with the Barbary Pirates; the Naples campaign; the influence of the Russian fleet in the Adriatic; the capture and recapture of Capri; the attempted rescue of the Pope; the island hopping campaign in the Adriatic; the invasion of Sicily; British attempts to capture Alexandria; the Russo/Turkish War; the siege of Dubrovnik and the British invasion of Northern Italy are just a few of the events of this multi- faceted war, with British garrisons including Ceuta; Minorca; Corsica; Elba; Capri; Sicily; Naples; the Ionian Isles; Dubrovnik; Trieste; Constantinople; even Marseilles, Corfu and Genoa. This list is far from exhaustive, indeed it is difficult to find many locations which were not affected by the war in the Mediterranean. The numbers of both troops and ships assigned to this theatre of operations is often difficult to specify with great accuracy, but certainly a graph showing the number of British battalions (this includes foreign regiments in British Service) on service in the Mediterranean, including Gibraltar, shows that on a number of occasions, particularly around the two invasions of Egypt in 1801 and 1807, army numbers in the Mediterranean were very high indeed, reaching a peak of forty-two battalions in 1807. But beyond that, the average number of battalions in the Mediterranean rose from an average of only twelve battalions on this station in the early years of the war from 1793 to 1799, rising to an average of thirty battalions between the years 1808 and 1814, showing a very significant near threefold increase in the army’s commitment to this theatre of operations as it became fully aware of its real significance. At the same time, in terms of total numbers of warships (both line and frigates) committed by the Royal Navy to the Mediterranean, a very different picture can be seen. It is clear that the importance of the Mediterranean was understood immediately and that warship numbers remained consistently high with an average of thirty-three warships on this service throughout the early years of the war from 1793 to 1798. There is then, perhaps at first glance, a surprisingly steady decline in numbers of warships in this sea during the period 1799 to 1803 by which time there were less than twenty ships in this entire area. This however, must be seen in the context of the ‘perceived threat,’ with the significantly reduced threat in the Mediterranean following Nelson’s stunning victory at the Nile and the increasing fear of invasion, pulling more and more resources into the English Channel. From 1804 however, a dramatic rise in ship numbers year on year deployed in the Mediterranean is very apparent as its importance is recognised once again. It finally reaches a peak in 1812, when no less than fifty-two warships were committed to this campaign. This is at a time when the threat from the French navy in the Mediterranean was at its lowest ebb, but is explained by a huge increase in the numbers of frigates and sloops deployed in this theatre for commerce and coastal raiding on a massive scale. It is therefore clear that the Mediterranean grew in importance throughout the war and that a very significant level of commitment was made to this theatre of operations by both services. There are also some rather surprising aspects of the campaigns, particularly as regards to the incessant requirement for the Army and Navy to work together; the incredibly long coastline of the Mediterranean offering an infinite number of opportunities for ‘combined operations’. This, as will be explored in the book, led to very different attitudes to operations, in a theatre where local commanders often found themselves at excessively long distances from higher command. Indeed, many operations were ‘ad hoc’ and cobbled together by local commanders without the knowledge of their seniors. For students of the wars fought under the Duke of Wellington with his stiflingly tight control of every aspect of operations, they will discover a very different, carefree and indeed ‘gung ho’ attitude by both the Navy, (which might well be expected by students of the Royal Navy during these wars), but more surprisingly also by the officers of the Army in this theatre. This obviously developed slowly throughout the extended period of the wars, but it forms a refreshingly different approach and one that may perhaps inspire the wargaming fraternity to look beyond the plains of Spain. However, the war in the Mediterranean and the adjoining lands, cannot of course be legitimately divorced or viewed as totally independent from the greater war that was being fought throughout Europe and indeed much of the world beyond. Much of the fighting here formed an integral part of a much greater strategic design, whilst the continually fluctuating fortunes of the various combatants and therefore their rapidly altering political stance further muddied the waters. All of these aspects must be fully understood and followed to fully appreciate the importance of the war in the Mediterranean to the overall picture. This downplaying of their influence is not new, for many soldiers, sailors and airmen fighting in the Mediterranean in both of the World Wars were often made to feel that they were involved in a very secondary campaign to the war in the Atlantic and certainly in comparison to the war on mainland Europe. This is despite the fact that the campaigns in North Africa and in Italy during World War II were truly vital to the maintenance of the war in the early days and played a significant part in removing a major ally of the main protagonist from the war, I think of Mussolini’s Italy of course. Clearly nothing has changed. I hope, however, that once you have read this volume, you will not only have a far greater understanding of the importance of the war in the Mediterranean and its influence well beyond its sphere of operations, but also a greater appreciation of its multitude of different facets. The operations that were undertaken within the Mediterranean were very varied, influenced markedly by the peoples, their cultures and the terrain. From the hot sands of Egypt to the bitterly cold mountainous terrain of the Adriatic in winter, the war went on. The men who fought so bravely here and often died there, deserve such recognition, however belated. The wars against Napoleon were known as ‘The Great War’ until 1918 when the appellation was passed on to what we know as the First World War.